Every once in a while, I like to post a true scarcity – a record which not only has considerable cultural import, but which is also nearly impossible to locate. I feel I can mention my personal feelings at the start, and in this direct manner, as an outsider: today’s post is not my own record. It is a generous loan from a friend and musicologist, which I transferred and repaired. The original – possibly the only known copy – is considerably damaged, but with a new transfer we were able to make it shine once again. Early recordings of the stunning classical Arabic and traditional music from Iraq are quite difficult to find. What’s more, the few early recordings of ethnic minority music from Iraq on any of the large, European labels, have nearly vanished without a trace. Further, the infinitesimal amount of early recordings of ethnic minority music from Iraq on local, independently-pressed labels, are truly gifts to behold. This record falls into that last category. It is one of the few, extant examples on 78rpm of the traditional music of Iraqi Turkmen. At least a half-million Turkmen live in Iraq and they are the third largest ethnic community in that country (behind Arabs and Kurds), representing 5% of the population (printed statistics state the half-million figure, although various Turkmen groups in Iraq claim a population of anywhere between 1-5 million, thus increasing their percentage of the general populus). Iraqi Turkmen primarily live in a central stretch of land from the Turkish and Syrian borders in the north of the country, to the Iranian border in the center of the country. This region is known colloquially as Türkmeneli. Descendents of Muslim Oghuz Turks, Turkmen first entered Iraq from Central Asia. Though there seems to be disagreement as to when Turkmen settlements in Iraq began appearing, one date that is mentioned is 650 CE. There is very little scholarly information in English on the traditional music of Iraqi Turkmen, as it is different from Turkmen music of other regions. This is hardly surprising, when a multi-volume book such as the Encyclopedia of World Cultures (1991-1996) does not even list Turkmen as a being a cultural population in the country of Iraq. Major texts ignore Iraqi Turkmen music, such as Grove or the Garland Encyclopedia of World Music, or the Rough Guide (scoff if you must, but the Rough Guide to World Music provides at least a passing mention of some extremely obscure traditional musical styles). Kurdish music, equally as beautiful and also ridiculously rare on 78rpm, has, by comparison, been generously studied. This piece is an example of a particular type of long-form song of Iraqi Turkmen, called qoyrat (also commonly spelled hoyrat, but pronounced khoyrat). The qoyrats are formed around a 4-line quatrain and defined by their style. This one is in the beshiri (beşiri) style. Qoyrats are also sung by Turkmen in Southern and Southeastern Anatolia – it’s a style similar to the bozlak, another epic folk song type from the region. In Turkish musical parlance qoyrat could be described as uzun hava – a free-rhythm song that could also be a lament, a poem, a play on words, or a wail. The term qoyrat in Turkish actually means “vulgar” or “boorish” – though this piece is anything but. Beginning with the strains of a typical sounding Middle Eastern ensemble, with qanun, violin, flute, and percussion, the vocals soon take over. It is a powerful love song and lament – sung in Turkish, albeit in a Turkish that might sound strange, or indecipherable, to a Turkish-speaking teenager of today. There are universally recognizable moments, however – for instance, when the singer, Ahmad, exclaims “aman aman” mid-way through the song…”aman” being understood from the Balkans to the Indian Ocean as an exclamation of grief and suffering. Abdul-Wahad Ahmad was known as “Abdülvahit Küzecioğlu” in Turkey. Born in 1924 in Kirkuk, Ahmad had a lengthy recording career, even recording for the BBC. He died in 2007. The Chakmakchi Company had offices and a showroom on the prestigious and bustling Rashid Street in Baghdad, along with a satellite office in Mosul. If we are to take the name literally, “chakmakchi” in standard Turkish means “maker of lighters” or “flint stone maker.” However, this is simply the surname of the proprietors, one of whom we know was named Arif Chakmakchi. At any rate, this small company got into the 78rpm business in the early 50s and only released at most about 200-300 recordings on their Chakmakchi Phon label. What distinguished them was that they catered to the local – local artists sold in local stores. What further distinguished them was their repertoire – not only did they record Iraqi classical maqam (by artists such as Nazim El-Ghazali and Mohammed El-Qabbandji), but they recorded music of the minorities. Chakmakchi Phon recorded some of the finest Kurdish singers in all their rawness – from the well-known, such as Mohammed Arif Jezrawi and Hassan Jezrawi (not necessarily related), to the lesser-known, such as Mahmud Kourouri, Khalil Aqrawi or Rasul Gardi. These records would, in some instances, due to the political situation, have to be smuggled in order to be sold in some regions. 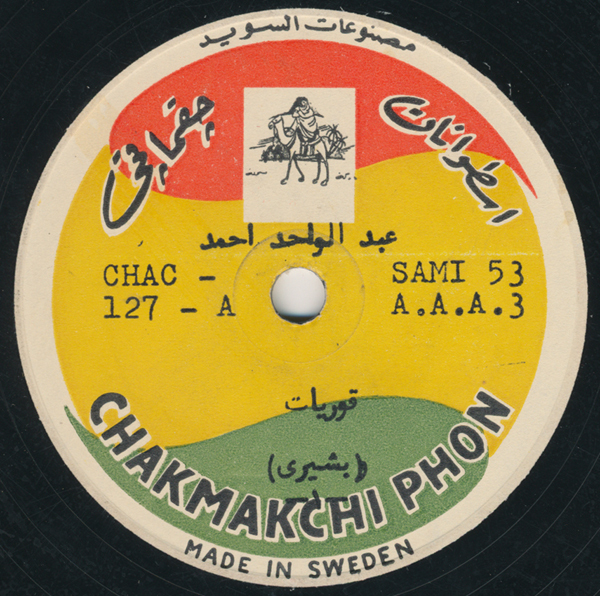 Since the Persian Gulf region did not have a 78rpm pressing plant at the time, Chakmakchi outsourced their early pressings to Sweden of all places (see the label photo), and their later pressings to Greece. It is strange that neither India nor Pakistan were considered, as both had thriving pressing plants – although both were run by the Gramophone Company, based in the UK. No matter what the case, Chakmakchi Phon did not last long in the 78rpm record business. They soon ceased producing 78s and moved into pressing 45s. Their musical legacy is only just beginning to come to light. Many thanks to our generous donor! And to Volkan, for providing further information. I resist using this blog as a platform for too much self-promotion, but it’s been a busy month or two, so I figured I’d get it over with at once. First, my first LP with Dust-to-Digital, Excavated Shellac: Strings, is now available from all manner of outlets. Aquarius Records gave it a nice write-up. Sasha Frere-Jones of the New Yorker added it to his Best of 2010 list. Thanks to Liz Berg and others for playing it on the radio. We hope to do more, and have other projects in the works, too. Also, I am indebted to writer and designer Meara O’Reilly who gave Excavated Shellac a nice write-up on BoingBoing. Thanks to Susanna Bolle, I had the chance to play records on her radio show Rare Frequency a few weeks ago. The show is now a podcast and you can listen here. It’s also officially our 3-year anniversary here at Excavated Shellac. I thought it was high time to finally register the domain, so you’re now on excavatedshellac.com. Why did I resist doing this for so long? For one, I wanted to remain under the radar. There seems little point to that now, so here we are. I’ll keep the rhapsodic ruminations to a minimum, but thanks to everyone who keeps coming back here to read text and listen to music. I obviously don’t have as much time to spend on the site as I used to, when I was posting weekly, but it’s still a pleasure for me. I want to emphasize again that this site is participatory. More and more people are using it as an information resource. Though it has a long way to go in that regard, I do think this is positive – but the site can only be as rich as the people who contribute. Unlike CDs or LPs, we always have the chance, with a website, to correct errors, contribute better translations, and in general, make the information more and more robust. The site, text, and music all have the potential to last longer than any hard copy because of this very fact. Some might be unaware that I edit the text on the site all the time if new information comes to light or someone sends a contribution. Sometimes, comments sections on posts from long ago suddenly spring to life (witness the family reunion that took place in the comments section of the Urbano Zafra post). The phrase “permanent beta” comes to mind – existing in a continuing state of upgrade. This, in a sense, is a more realistic view towards an information resource, if we want to take it to the next level. I can only do so much, and besides, there are records to find! Momentous Jon! Powerful music and singing, brilliant work on bringing out the sound, and truly amazing if the disc was in bad shape as you say. The original engineer must have had a hard time handling this stentorian voice in the studio. The singing is very moving – with no trace of the Arabic way of singing, in contrast with the more familiarly Iraqi-Arabic aspects of the violin playing, this passionate vocal style rather places itself, at least as I hear it, in between Persian, Kurdish and Turkish styles and techniques, maintaining a beautiful fluidity. I too would like to thank your anonymous donor! Now this is one that’s going to reward plenty of repeated listening and reflection, just as your outstanding annotation is going to reward repeated reading. Fantastic record. Many thanks, as ever. What an incredible recording. And yours is an incredible site. Congratulations on your anniversary and success with the LP. Well deserved! LOVE the fiddle on this! Amazing stuff. I’ve been looking for more music from Iraq. I’ve mainly had to be satisfied by relatively recent recordings, such as those I’ve found on the Sublime Frequencies label. And I’ll just add myself to the praise singers! Good also that it is so ery good music! Thank you very much for keeping this site such a worthwile excursion. Happy anniversary and all the best of luck and success with the LP! Best wishes from Bolingo and the people of Luobaniya! Thanks for this great record. It’s a pleasure to hear Abdul-Wahad from 78 rpm. And congratulations for the anniversary. Thank you, Volkan, for the illuminating information! Outstanding post, J., and congrats on all of your recent ES- and 78-related developments. Re Excavated Shellac: strings: Just got and listened to my copy. This is a stunning piece of work – technically as well as musically. Trouble is, I now want more (please)! Just wanted to parrot Mark’s comment–I’m really enjoying the LP. Thank you, Mark and Adam! I read with great interest your column on the label Chakmakchi Phon Label (Made in Sweden) and I would like your opinion on an interesting discovery made ​​a few months ago. I was very interested about your blog but especially this column that I made ​​my discovery even more exciting. This is a recording made ​​in sweden on chakmakchi Phon Label. The label look the same as the picture on your blog with a little difference.The 78 rpm remains in perfect condition, in near mint condition, with the same label (CHAC-41A & CHAC-42A) but instead of the image of a camel, we find a picture of a Arab Women wearing a scarf over her hair, probably as the singer can be heard on the disc. The original cardboard cover is almost in perfect condition.We find on the cover of writings in Arabic which I can not translate and advertising a brand of bicycle (unknown), a car battery (Wilhelm Hagen), a radio (Luxor Radio) and the image of a seated woman listening record on an old sound system. Please, could you tell me information about this record. No other place, I found information about this label. Additional information that I forgot to mention about this record. The record label and its cover are signed with pen “Lawee”. Thank you so much for these incredible discoveries. I collect Chakmakchiphon records (Particular 45’s). I am very intrigued about your statement, that also 33rpm records were pressed. Do you have any more information about this? Would really love to know more. Hi Mads! You’re absolutely correct – I’ve amended the post. I don’t know where I got that idea 6 years ago, but I see in my old notes where I made that error. I double-checked with another collector of Iraqi music in the region and he confirmed they only pressed 78s and 45s. Thanks! I just found a copy of this myself. Incredible music. Also, I found another 78 shellac by Abdel Wahed Ahmed – With cat. 126. I am not sure if I am allowed to post this, but here is a link to my youtube channel. I have uploaded both 126 and 127. Let me know if you need them files to upload to your site. You are doing an incredible job!